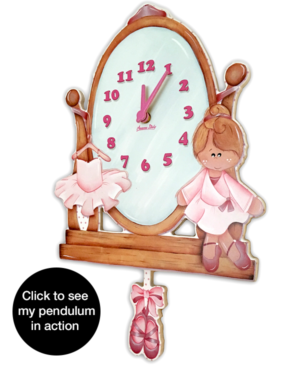 This Ballerina Wooden Wall Clock With Pendulum is a hot favourite for all budding ballerinas. 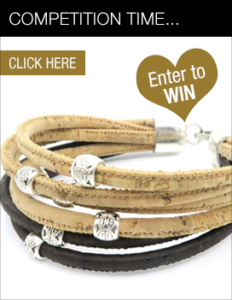 The intricate detail and craftsmanship is simply exquisite. 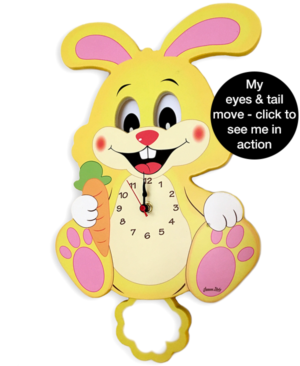 This Bunny Face Wall Clock is simply adorable. 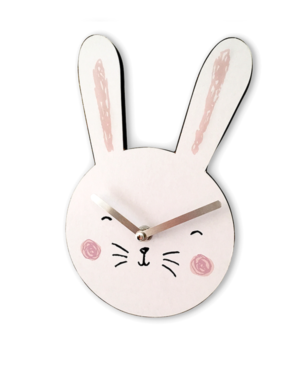 The chrome coloured clock hands against the white background is incredibly striking, whilst the hand drawn look – from he cute whiskers to the hints of pink softens the look and creates a charming rustic edge to this wonderful bunny face clock. 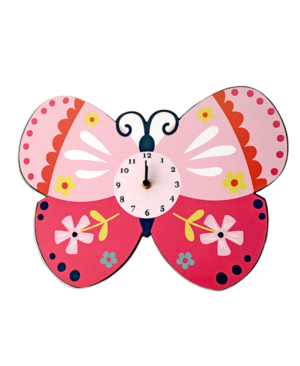 This butterfly wall clock is beautiful, with vibrant colours and a wonderful design. The butterfly wings are a lovely combination of bright pink against a contrasting paler shade of pink. 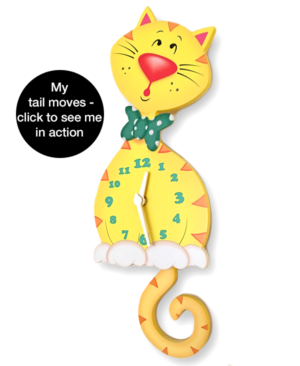 This Cat Wooden Wall Clock With Pendulum oozes personality that is sure to appeal to little ones. 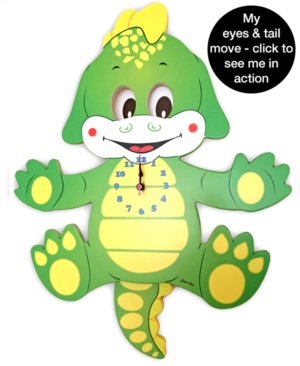 This Dragon Wooden Wall Clock With Pendulum not only looks great, but also has some fabulous hidden extra’s that may it particularly special! 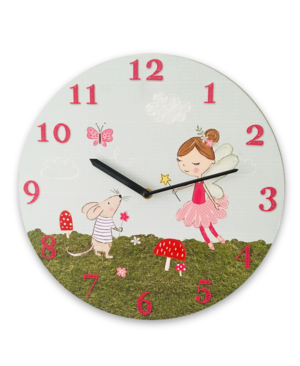 This Fairy Wall Clock is a lovely addition to our range of children’s clocks. It features a magical scene of a beautiful fairy in a pretty pink dress holding her wand as a cute little mouse presents her with a flower. 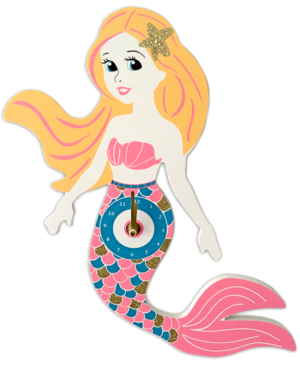 This Mermaid Wall Clock is a beautiful addition to our range of children’s clocks. This wonderful aquatic creature is brought to life with lovely vibrant shades of pinks and blues. Her resplendent golden hair flows down her back and her tail is highlighted with beautiful areas of glittery gold that add a touch of sparkle to the design. 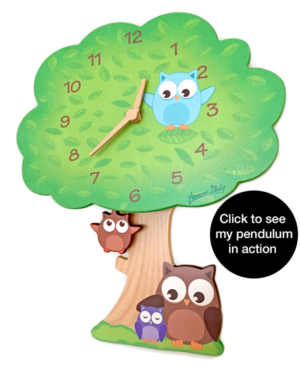 This Owl Wooden Wall Clock With Pendulum is a fabulous addition to our collection of Italian designed and crafted children’s room accessories. 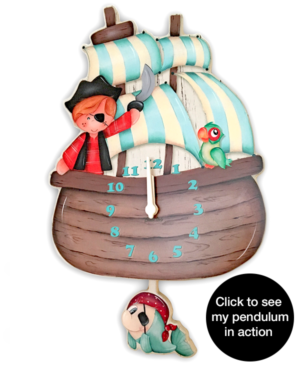 Ahoy there captain – this Pirate Wooden Wall Clock With Pendulum is sure to be a big hit with lovers of all things pirate themed! 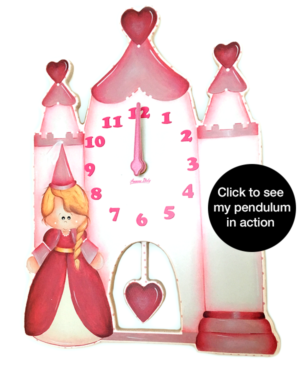 This Princess Wooden Wall Clock With Pendulum is beautifully designed and painted using incredibly pretty shades of pink. This Rabbit Wooden Wall Clock With Pendulum is beautifully designed and crafted using birch wood and non-toxic watercolours. 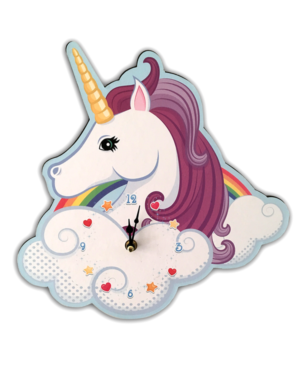 This Unicorn Head Wall Clock is vibrant and fun. The unicorn floats on a fluffy cloud, which forms part of the clock face and is decorated with pretty heart and star embellishments. A wonderful rainbow sits behind the head of the unicorn, which adds a further bright and colourful dimension to the design.